setting up image based lighting (IBL) in Cycles isn't all that difficult but creating a versatile setup requires a lot of repetitive actions that lends itself well to automation. 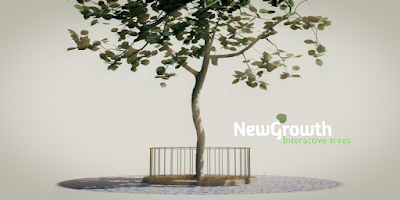 In this article I present a simple add-on that may be accessed from the Add menu in the node editor to quickly set up all the nodes for environment lighting. Note: as of 2015/03/13 a bug fix release is available on GitHub. One of the resources I find myself using quite often is the SIBL archive. Each archive is basically a directory (commonly packed as a .zip file) that contains both a high resolution backplate and HDR environment and reflection maps. It also contains an .ibl file that documents the resources available in the .zip file. The add-on uses this .ibl file to create all necessary nodes and references to the images. I am not sure how widely accepted the SIBL format is, but the add-on can also be used by simply selecting a .jpg and a .hdr file instead of a .ibl file so you are not restricted to just SIBL files. It is available on Github as a single file sibl.py. You can directly save it to your download directory via this link. Open the add-ons section of Blenders User Preferences and click Add external add-on. Select the downloaded file and click install. After installation you may find it in the Node section where you can activate it. In the add-ons section of the user preferences. It sits in the Node category. Click the world icon in the node editor. Click the world icon in the node //editor. If you select more than one file, a file with a .hdr extension will be used as the environment lighting and the other one as the backplate. After selecting the files the node setup will be displayed in the node editor. If there were any issues with the .hdr or backplate images the corresponding environment texture node is colored red. This may happen if the file is unreadable for some reason or if the the .ibl file points to non existing files. This one is only present when opening a .ibl file. It selects a higher resolution environment map suitable for glossy reflections (if available). You probably should only use this if you want to see the environment reflected in glossy surfaces because a reflection .hdr uses a lot more memory than a low resolution .hdr environment map. Uncheck this if you want to keep any existing nodes in the world node tree. If unchecked a world output node will be reused if present, as are any texture coordinate and light path nodes. Other nodes are untouched. While developing this add-on I noticed that the [Environment] section in some .ibl files was spelled without an n. This is probably a bug but this add-on accepts both spellings. (An .ibl file is formatted as an .ini file, a common file format on windows and easily parsable with Python's configparser module. All meta-data in .ibl files is ignored. This means any sun or additional key lights defined in the file are ignored. Also, all image files are currently assumed to be spherical (a.k.a. equirectangular or LatLong format, Blender's default mapping for environment textures). This means that light probe maps are currently not supported. I use the latest Blender 2.78c and was able to install sibl.py. It shows up in the Node Editor but when I select either of the two options for adding environment it doesn't do anything. I don't get any error messages but simply nothingness. Is this still a valid addon for Blender or is it obsolete? seems to be working ok with my 2.78a and the Newport Loft set. I'll download 2.78c later this week and see if it behaves the same. there are no error messages in popups but are there maybe error messages on the console? I will do some more testing tonight and will check if any errors show up in the console and post it here. Thanks again. Good news (and some little bad news). I was using "shift+a" shortcut to add the environment nodes and it definitely doesn't work from there. I wasn't getting any error message in the console and thought it was odd. 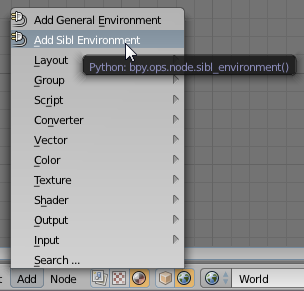 For fun, I used the menu item "Add" in the node editor and selected "Add Sibl Environment" and it worked! (it does also work for "Add General Environment" from the menu). 1) If I delete a newly added node "Add Sibl Environment" (added from the "Add" menu), I can subsequently add another "Add Sibl Environment" from the shortcut "shift+a". 2) However, if I delete a newly added "Add General Environment" (added from the "Add" menu), I can not add another from the shortcut "shift+a". For some odd reason, the context is remembered only for "Add Sibl Environment" when adding subsequent nodes with "shift+a". I can live without the option of adding the two nodes from the shortcut (even though I use it all the time to add node but that's quite alright). Anyway, thanks for your great little add-on - it saves me time! Glad to hear it works :-) Shortcuts are a bit of a strange beast in Blender, never gave them much thought for this add-on. Might have a more in-depth look in general and I'll keep this behaviour in mind.